Beautiful things always happen when I'm least expected. 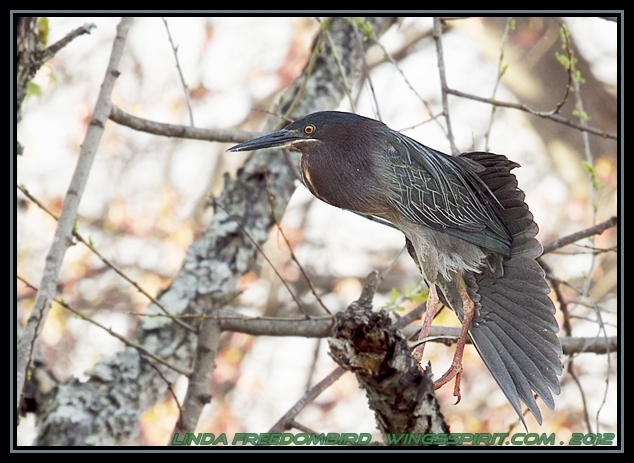 Capturing this Green Heron is another example. 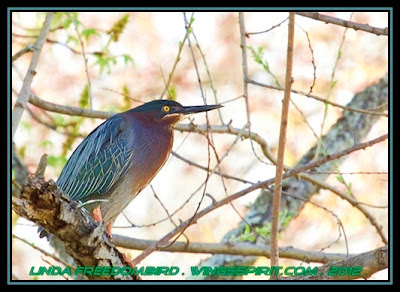 Green Heron (Butorides virescens) is a not a rare bird and you start seeing more of them from April through October. They breed in Georgia but it's hard to spot them because they often stand motionless and wait for the prey to come by. On my way home from visiting a friend from Duluth, I saw few Mallards flew and landed in this community lake. Everyone will agree that Mallards are so popular everywhere, most people will not care much about them. I pulled over and just wanted to check around the lake to see if I have any luck finding something interesting. As soon as I took out my binos, I found 9 Ring-necked Ducks (post coming soon). They seemed relaxed and not in a hurry going anywhere. I started slowly walking towards the lake and in the mean time, warming up my camera. Not surprised, these shy ducks started swimming away as soon as they saw me coming. I decided to stay a bit longer and took out my mp3 player and started listening to my favorite song, a piano version of "Someone Like You" sent by my best friend :) Suddenly, a green bird landed in front of me. I wanted to scream, but I kept my cool and could not believe a beautiful Green Heron just touched down about 50 feet in front of me. I thought it's dinner time and I might see him catch his fish. But all he does was relaxing and preening his feathers for a good 20 minutes.